Depth of field is a basic premise of photography and is important to understand when capturing images of food. It’s the range of distance that’s in focus within a given shot. In other words, depth of field is the distance from the closest point to your eye that appears in focus to the farthest point away from your eye that still seems to be in focus. A shallow depth of field has only a small distance range in focus. The following figure illustrates a shallow depth of field via a row of nectarines. 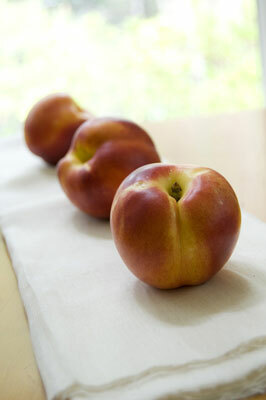 The depth of field range starts just in front of the first nectarine and ends very close to the stem of the fruit. A shallow depth of field focuses on a shorter distance. If you want to increase the separation between the subject that’s in focus and the background that isn’t, use a longer lens. Basically, a longer lens helps get the background a bit more blurred out to make the subject in the focus area even more distinct. The following figure has a much greater depth of field — a much greater area of the image is in focus. How much of the field of view is in focus affects the look and feel of the photo. Greater depth of field broadens the focus of the image. Focal control is primarily affected by the aperture (f-stop) setting on your camera (and your focusing mechanism, of course). Because aperture regulates the amount of light that falls on your camera’s sensor, it affects what will be in focus. For example, a wide open shot, such as f/2.8, allows the maximum amount of light to fall on your camera sensor. This wide open shot, coupled with a fast shutter speed, provides a narrow depth of field. The subject is in focus, but the background is blurred. Increasing your aperture number, or stopping down your lens, decreases the amount of light that falls on your image sensor. 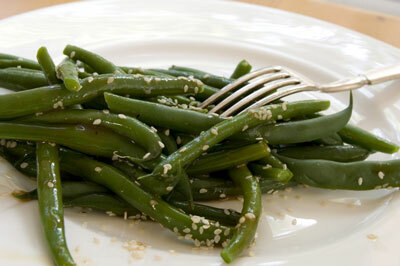 A bigger aperture, such as f/9, has a much greater depth of field, and much more of the image is in focus, as illustrated in the preceding green beans image. These days, many photographers use the program or auto mode on their cameras to automatically set the aperture and shutter speed for a photo. Using these modes is extremely handy when shooting and produces some lovely, properly exposed images. The downside to using the program or auto mode is that you don’t have as much control of your focus area as you may want. In food photography, having this control is so important because you may need to create a specific look or focus on a specific area of a dish for your client. To get greater control of your focus, switch your camera’s shooting mode to aperture priority mode, which allows you to select the aperture manually and wrestle focus issues to the ground. More light = lower f-stop number = tends toward a shallow depth of field, or selective focus. Less light = higher f-stop number = tends toward deep focus (greater depth of field).